Above photo courtesy of Freed of London. Think of classical ballet and a woman dancing in pointe shoes immediately comes to mind. Pointe shoes were originally designed to allow women to appear weightless in Romantic era supernatural, otherworldly roles as Sylphs, Wilis, Nymphs, and Fairies that permeate Giselle, Swan Lake, and La Sylphide. Since Marie Taglioni first danced in pointe shoes in 1832, the shoes have evolved to allow dancers to perform steps on the tips of their toes for extended periods (see the Gaynor Minden website and Wikipedia for more detail on the history of pointe shoes). I’ve always been fascinated by pointe shoes since my dancing days when I observed dancers going through strange rituals with their shoes: banging them on the floor and wall, bending them until they crack, applying substances such as shellac, all for something with a very short life. I really didn’t understand the full story on the shoes and never will given that, like most men, I’ve never worn them (OutSmart Magazine has an interesting and humorous article on the few men dancing in pointe shoes). This post is designed to shed light on the important role that pointe shoes play in classical ballet and in part answer questions that have lingered in my mind for over 30 years. I attempt to answer basic questions such as how long the shoes last, how many pairs a ballet company goes through, cost, major brands, and whether wearing the shoes hurts. Emily Kikta, Movements for Piano and Orch. Thanks to NYCB dancers Emily Kitka (@EKikta and Emily’s YouTube Page) and Lara Tong, and Miami City Ballet’s Rebecca King (@BexKing) for answering my many questions on their shoes (Rebecca has a website Tendus Under a Palm Tree, an informative site on the life of a professional ballet dancer). Double thanks to Lara for giving me a pair of her old pointe shoes that are in photos below. 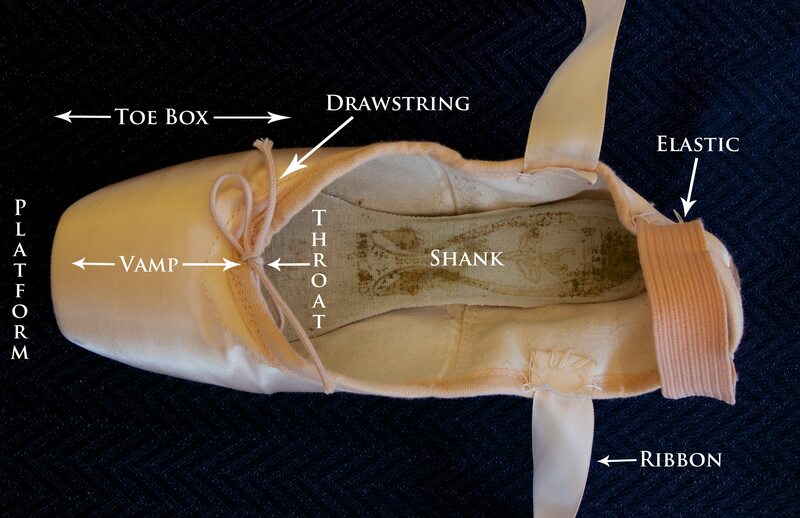 It turns out that all three wear Freed shoes, but the basic information applies to other shoes, with the exception of Gaynor Minden as I will explain later in the post and in more detail in my second post on pointe shoes later in February (update: click here for Part II). Here are photos of Lara’s pointe shoes. Click on the photos for a larger image. What are pointe shoes made of? In traditional shoes, the toe box is made from tightly packed layers of paper, cardboard, burlap, and/or fabric held together by glue. The material is compressed into an enclosure (toe box) that surrounds the dancers’ toes so that her weight rests on the platform. The shank is generally made of cardboard, leather, or a combination. The outer material is a soft cloth called corset satin. The materials and methods of construction have not changed much in the last 100 years. Gaynor Minden shoes are different from the rest. Gaynor Minden shoes have elastomerics (material that is able to resume its original shape when a deforming force is removed) for its shanks and boxes rather than the traditional materials of cardboard and paper, held together by glue. What are the major pointe shoe brands? A great website Pointeshoebrands has a list of about 85 pointe shoe brands around the world and has links to company websites. However, the market is dominated by the shoe companies listed below. I don’t have market share information, but most dancers you see onstage wear one of the brands listed below. Why do dancers wear a particular brand? In some ballet companies, the preponderance of dancers wear a particular brand. Most NYCB and Miami City Ballet dancers wear Freed of London while dancers at the Australian Ballet wear Bloch shoes. At other companies like ABT, dancer preferences span the list of companies below. At companies without affiliations with shoe companies, dancers probably select shoes based on dancer recommendations, leading dancer endorsements in advertising, and trial and error in an effort to find the perfect shoe. Bloch is an Australian company founded in 1932 by Jacob Bloch, a shoemaker who immigrated to Australia from Eastern Europe in 1931. Jacob loved music and dance; noticing a young girl struggling to stay en pointe, he promised he would make her a better pair of pointe shoes. He started making shoes in 1932 in Paddington, Sydney and his reputation for high-quality shoes grew as many ballet companies toured Australia during the 1930s, particularly Russian companies. Today, Bloch is headquartered in Sydney, Australia, with a European office in London. Salvatore Capezio opened his shop near the old Metropolitan Opera House in New York City in 1887. He was only 17 years of age and his original business was to repair theatrical shoes for the Metropolitan Opera. In the late 1890s, he turned his attention to making pointe shoes. His reputation grew; Anna Pavlova purchased pointe shoes for herself and her entire company in 1910, helping Salvatore’s business. His success spread and by the 1930s, his shoes were used in many Broadway musicals and in the Ziegfeld Follies. Frederick Freed founded the company in 1929; before starting his company, Freed and his wife made ballet shoes at Gamba. After starting Freed, they worked from a basement in the Covent Garden section in London, the same site where the brand’s flagship store now stands. Today, Freed of London is a sister company of Japanese Dancewear company Chacott; both companies are owned by Japanese apparel company Onward Holdings. Freed of London sells in over 50 international markets through direct business partners and distributors. Eliza and John Minden opened their first store in the Chelsea section of Manhattan in 1993. Eliza is the Head of Design at Gaynor Minden having spent nearly a decade of researching and developing a prototype shoe, testing hundreds of prototypes. A former avid amateur dancer, she had witnessed the introduction of high-tech materials into athletic equipment and believed that pointe shoes could also be improved with the use of modern materials. Gaynor Minden uses elastomerics for its shanks and boxes rather than paste and cardboard used in traditional shoes. Nikolay Grishko, a businessman with a passion for ballet, founded Grishko in 1988, shortly after President Mikhail Gorbachev fostered the development of private enterprise in the USSR. At the time, Russian hand-made pointe shoes were not generally available to dancers outside of Russia. Nikolay capitalized on the demand for Russian shoes to create a global business in the manufacture and distribution of pointe shoes and other ballet gear. In 1989, the company introduced Grishko shoes to the U.S. ballet market. Franck Raoul-Duval, a 25-year-old Frenchman with a passion for dance and Russian history, founded Sanscha in 1982. He developed a new type of ballet shoe, the split-sole ballet slipper, with a glove-like fit. Sansha now manufactures a range of dance shoes from ballet, jazz, hip-hop to flamenco, and ballroom to tap. 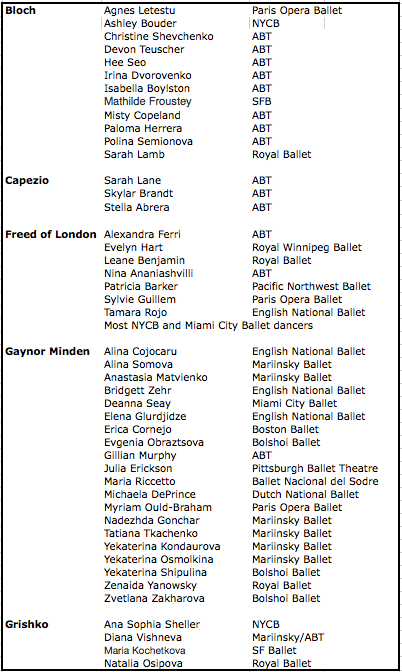 Here is a list of prominent dancers and their brand of pointe shoes. I came up with the list based on internet searches; the list is not complete and may not be currently accurate as dancers switch brands, but gives some insight on what brands dancers wear. How much do pointe shoes cost? The retail cost of pointe shoes is presented in the table below as of early 2015. The price does not include the cost of ribbons, which are approximately $5. How long do pointe shoes last? The Grishko website estimates that the average life span of a pair of shoes is 4-12 hours of work, depending on the type of classes and the level of pointe work. Griskho recommends changing shoes after 45-60 minutes of work (30 minutes for dancers that perspire heavily) and letting them dry out for a minimum of 24 hours before using again. On the other hand, Gaynor Minden shoes made of modern materials last on average about five times longer than traditional brands according to Cunningham et al. in The American Journal of Sports Medicine. How many pointe shoes do ballet companies use in a year and at what cost? Given that traditional shoes last between 4-12 hours, major ballet companies go through a lot of shoes. Pointe shoe expenses are a major cost of ballet companies and many companies have dedicated pointe shoe fundraising drives; much of the information below is from these appeals. • ABT spends $500,000 a year on pointe shoes. I use an estimate of $70 per pair for ABT’s cost (ballet companies pay less than retail cost), which leads to 7,100 pairs of shoes a year split among approximately 45 female dancers. That’s about 160 shoes per dancer every year. • NYCB spends $600,000 a year on pointe shoes. An estimate of $70 per pair leads to 8,600 shoes a year. With approximately 50 female dancers, that comes to about 170 pairs per dancer a year. • The Royal Ballet: “Every year The Royal Ballet uses 12,000 pairs of shoes at a cost of 250,000 pounds,” (about $400,000). However, the 12,000 pairs of shoes probably includes men’s shoes and slippers. An estimate from The Guardian puts the total number of pointe shoes used at The Royal Ballet at 6,000-7,000 pairs a year. • English National Ballet: English National Ballet uses 5,000 pointe shoes a year (information from video). • The Miami City Ballet uses 3,000 pairs of shoes a year. Marianela Nuñez of The Royal Ballet discusses her pointe shoe use in The Telegraph: “During the day I can get through two pairs of shoes in rehearsals; if I’m dancing in a three-hour ballet, I use one pair per act, so three pairs can go in one night.” She wears Freeds. Most major companies have a shoe master or manager to manage the process of recording dancer specifications, ordering the shoes, and coloring the shoes if necessary. The Birmingham Royal Ballet has a nice profile of its shoe master with a summary of his responsibilities. Do professional dancers wear custom made shoes? Most professional dancers wear custom or special order shoes. Freed offers special order shoes in which the dancer can specify the shoemaker, length, width, type of block, custom vamp, insole type, among other items. 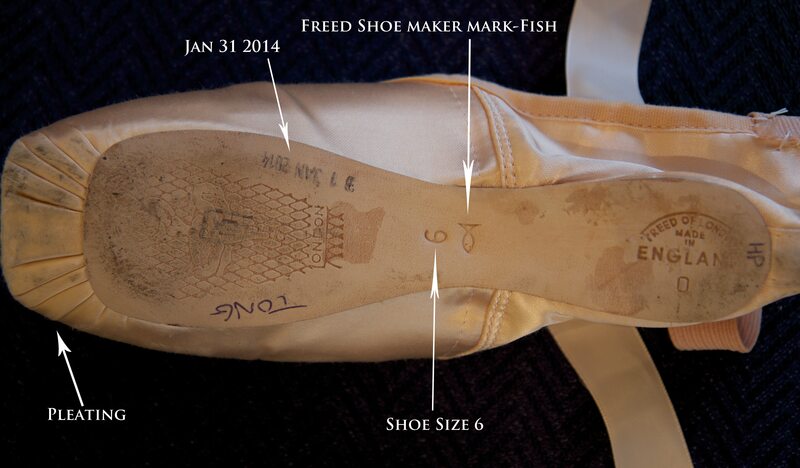 The Freed website has a list of shoemakers-all that have photos are men-with letters and nicknames (such as Butterfly Maker, Club Maker), number of years making pointe shoes, and personal interests. Like most dancers at NYCB and Miami City Ballet, Emily, Lara, and Rebecca wear custom made Freed shoes and a common theme among the comments below is the great benefits of wearing custom shoes. Emily: My shoes are custom made and I feel so lucky that we can do that here! My shoes are Freed Classics with the Bell maker. I don’t do many crazy customizations besides a little extra glue in the box and a little less satin on the sides so I don’t get any bunching on the sides of my feet. Lara: I’ve worn shoes from many makers at Freed. I used to wear from another maker, but now I wear shoes from Fish and Crown makers. Rebecca: At Miami City Ballet we all wear custom shoes. Our shoes can make or break our dancing (as hard as that may be to believe). If you have too much material on the top of your foot, you won’t be able to get all the way en pointe. If the bottom sole of the shoe is too soft, you will go too far over when you are en pointe. If the tip of the shoe is too soft, your shoes won’t last more than an hour. These are the sorts of things that are determined by each dancers’ individual foot. So the ability to have shoes customized really is invaluable to us. I have worn Freed of London since I was a student. When I started dancing with Miami City Ballet as a student in the school, I was delighted to find that they provided me with shoes for performances. The first time I was presented with shoes from the company felt like Christmas to me. The shoe master offered me shoes that were in my size: special order Freed shoes that one of the principal dancers in the company could no longer wear. I was amazed by the world of shoe customization! It seemed as if my options were limitless. They are in fact so limitless that eight years later I find myself continuing to chase the mythical “perfect” shoe. Pointe shoe brands have different representatives who travel around the country helping dancers find their perfect shoe. I wouldn’t say that they try to convince dancers to switch but if the dancer is interested, they help them with their customization and other issues. Freed USA sends their pointe shoe specialist, Marie Johansson to Miami City Ballet about once a year to help each ballerina with her shoes. She brings a very impressive setup with her: hundreds of different shoes, including different sizes, different makers, etc. She is great with helping each find what they need and helping to customize shoes tailored perfectly to each dancer. Are all custom made shoes the same? Rebecca: I wear custom made Freed shoes, and sometimes a shipment of shoes will come in a little different than a pervious one. Amazingly these small inconsistencies make a big difference. Emily: Since all Freed Classics are handmade, there are definitely going to be variations. Usually you can tell before you put them on if they are going to be good or bad shoes. But most of the time you can make a shoe work for something even if it is a little weird! How do dancers break in their pointe shoes? Dancers break in shoes in many different ways. Here is an interesting video from The Australian Ballet. Four dancers discuss their breaking in process, which includes the use of knives, matches, and shellac. Emily: I break in all of my shoes the same way no matter if they will be used for a show or just rehearsal. I don’t do anything too crazy though: just a little glue in the tip, bend the top of my shank and take the nail out of the heel so it doesn’t stab me! Rebecca: I usually save good shoes for performances. I find that I will try to wear my least favorite shoes for rehearsals and classes. I generally prefer shoes that are brand new, so to prepare them for a show, I usually will just wear them for one class. I have even been known to put brand new shoes on right before going on stage. Again this is all preference, and everyone is different. Lara: I don’t use special shoes for performance. I always break in my shoes the same way-I step on the box to flatten it a little and then bend the shank. I used to take the nail out from the shank and split it apart from the bottom, but now I custom the shoe to not have a nail. Then for a show, I bang my shoes on the wall to make sure they’re not loud. She breaks in a new pair during class then puts them away for that evening’s performance. For rehearsal, she wears the shoes from the night before. Though she’s not sure how many pairs she wears in a season, Bouder typically uses one pair per performance, but if she’s dancing a full-length ballet such as Swan Lake, she’ll use at least two pairs in one night. Do dancers wear more than one pair of shoes in a performance? See those nice shiny pointe shoes a dancer is wearing at the beginning of a performance? Chances are the dancer will not be wearing the same pair at the end of the performance. Rebecca: This really depends on what the evening entails. I find that for some ballets I need brand new shoes, while for others, I prefer ones that are a bit softer. I usually determine this based on the choreography: if there is a lot of pointe work or turns, I find that I need a very solid shoe, while something that involves more jumps call for softer shoes. So I often find myself changing shoes more out of preference than necessity. Lara: Depending on the programs that night, I can use more than one pair. Sometimes I’ll wear a new pair for one program (like Serenade) and then sometimes an older pair that’s been worn a few times (like Princesses in Firebird). Emily: My routine usually is to wear a different pair for each ballet I am performing that night. That way my shoes are never soggy or too dead by the time I get to the last ballet. This is very important since by 9:45 pm you’re pretty tired and may need a bit more support for the final ballet of the day. Marianela Nuñez: As quoted in The Telegraph, Marianela uses one pair per act. In a full-length ballet such as Don Quixote, she goes through three pairs. When do dancers discard a pair of shoes? Lara: I discard a pair of shoes when the boxes are uneven because it’s dangerous to dance on; at that point, it’s too soft to give me adequate support. I think it’s very important for our longevity to have shoes that provide enough support. Emily: This is definitely different for each dancer. For me, I usually need to discard my shoes once the right shank has died. That will always die first for me because my right foot is a little bit more flexible than my left! Rebecca: Usually my shoes die first in the box. When do dancers wear their pointe shoes in ballet class? A dancer starts their day with ballet class. A ballet class generally lasts 90 minutes with the first part consisting of barre exercises and the second part center work consisting of adagio, petite and grande allegro. Some women wear their pointe shoes throughout ballet class while other wear slippers, which are made of leather or canvas, similar to what men wear. Practices among women differ as Emily, Lara, and Rebecca explain. Rebecca: I wear pointe shoes for the entirety of class, every day. I used to wear flat shoes for barre and put my pointe shoes on for center, which is quite common. I would find that it would take my feet awhile to become warmed up enough to dance in the center, so I began putting my shoes on as soon as I step in the studio in the morning. This has been very beneficial to my pointe work and the strength in my feet and ankles. Emily: Up until very recently, I would always wear my pointe shoes from the first plie of the day until the day was done. However, after dealing with some tendon issues, I’ve started wearing wool socks or flat shoes for barre. It gives my feet a slower warm up to make sure I don’t overstretch anything. I do prefer wearing pointe shoes at barre though, so I hope to one day get back to that! In the off season, I pretty much have the same routine with my shoes because it’s necessary to keep my feet acclimated to pointe shoes so I don’t get blisters. Lara: It’s really up to each dancer, but I wear flat shoes for barre and pointe shoes for center. It’s nice to be able to roll through my feet early in morning without pointe shoes to give my body a chance to warm up. When I’m not performing, I usually try to take class to stay in shape and that’s when I’ll wear my shoes. There are some girls who like to wear their pointe shoes around at home to prevent their feet from weakening too much. Does wearing pointe shoes hurt? Emily: At this point I am pretty used to wearing pointe shoes for long periods of time. Unless we are doing a ballet like Swan Lake with a lot of bourrees, my toes don’t hurt that much. More than anything, my arches cramp before my toe nails hurt. I can’t say that this is a better pain though! It still is quite uncomfortable. Lara: Yes, my toes definitely hurt after wearing pointe shoes for long period of time, even after years of dancing and forming callouses. I think it’s only natural because pointe shoes only provide a very small and tight space that puts pressure on my feet in ways that aren’t meant to happen to the body. Although I’m used to the feeling of pointe shoes, I still get aches and bruised toe nails. To limit discomfort, I soak my feet in epsom salts and elevate/ice to reduce swelling. I personally find 2nd Skin to be a miracle worker when my feet hurt. Rebecca: My feet always hurt the most when we come back from our summer layoff, where we are off for three or more months at a time. I always come back to work in-shape and ready to dance, but there is no way that you can prepare yourself to be in pointe shoes for 7.5 hours in one day. A dancer’s feet really do become accustomed to the shoes when wearing them on a regular basis, but during an off-season, skin softens and getting that back is a long and tedious process. Unfortunately, all you can do is wait. And in the mean time, we use tape, oral numbing gels, 2nd Skin, ice baths, and Epsom salt baths to make the days more comfortable. Look out for Part 2 on my pointe shoe journey next month. The post will focus on shoes made from modern materials, in particular Gaynor Minden. Update: click here for the post. Feel free to drop me a comment on your pointe shoe experience. Disclosure: I have no financial interests in any shoe or dance accessory company.